You can go for free, or you can go for paid when it comes to pricing your mobile apps. Or if you’re Guardian News & Media, publisher of Guardian.co.uk, The Guardian and The Observer newspapers, you do both. GNM launched its Android app this week, available to download for the low, low price of absolutely nothing. A short-term sponsorship deal from Samsung lightens the burden of in-house development costs, just as the Guardian’s impressive Eyewitness iPad app has long-term sponsorship from Canon. 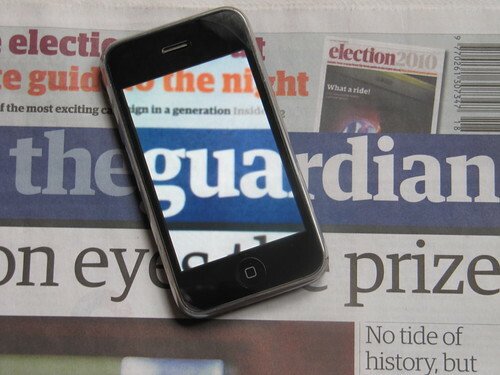 The free content-loving Guardian was keen to point out when it launched the first version of its paid-for iPhone app in 2009 that it had no prit’s noblem charging for access to content on devices, just as it charges £1 a day for the printed newspaper. The recently launched Kindle edition is £9.99 a month, so this is slight departure. – Since the latest version of the iPhone app launched in January, it’s now clocked up 509,264 free downloads and and 86,000 subscriptions at either £3.99 a year or £2.99 for six months. “If you look at the broad strategy principles, the mobile site is a free product, has great stats and a way to give everyone a great experience – but with applications we are looking at them slightly differently. As part of that thinking we are looking at what will create a sustainable business model,” he said. Wing highlights the success of the m-site, which now accounts for 12 percent of all visits to Guardian.co.uk. That will remain free for the long-term forseeable future, just like the main site, monetised by ads and sponsorship. This is a pragmatic approach and it mirrors a thoughtful talk and essay from Guardian information architect Martin Belam last week, who argued that different platforms require different approaches: “Mobiles are not tablets. Tablets are not desktops. And neither of these things are print products,” he said. But this strategy can only go as fast as the audience will grow. Mobile ads are still in their infancy (in revenue terms, if not in actual years) and sponsorship deals may cover costs but they will struggle to grow mobile revenue over the coming years. Initially I was curious why a top publisher would de-value its entire digital output by giving it away from nothing when there’s a clear route to monetisation through charging. At times I want to say to the Guardian, “please let me pay you more for all this content I’m enjoying,” and I still think £5 for a year subscription to the iPhone app (about £0.01 a day) is too cheap. The forthcoming iPad app will have a more robust pricing structure, no doubt. But the risk of free mobile publishing is a big one: will mobile readership and – more importantly – mobile ads accelerate fast enough to make this investment worthwhile? According to figures from IAB/PwC, mobile advertising grew by 166 percent to £83 million in 2010, up from £37.6 million in 2009. That’s good growth, but it’s from a low base and WARC predicts UK online ads overall will only rise 2.3 percent this year. So it’s good strategy to be on Android right now – let’s hope the economy picks up. Picture via TimDifford on Flickr, via a Creative Commons licence.